As a little boy battling leukemia, happy moments were few and far between for 8-year-old Alex Meier. But when he recently received a phone call from the Make-A-Wish Foundation telling him that he could wish for absolutely anything he wanted and they would make it a reality, he finally had a reason to smile. There was one problem, however: After dwelling on it for days, Alex just couldn’t think of anything he wanted. With his condition worsening, the good people at Make-A-Wish decided that even though Alex couldn’t make up his mind, they would still give him an incredible surprise anyway. So, earlier this week, they gave him the exciting news that they were going to take him to a deli and slide him down the counter like a big sub sandwich! Helping him out of his hospital bed and into his wheelchair, representatives from Make-A-Wish took him over to a nearby deli to give him the best day of his life. 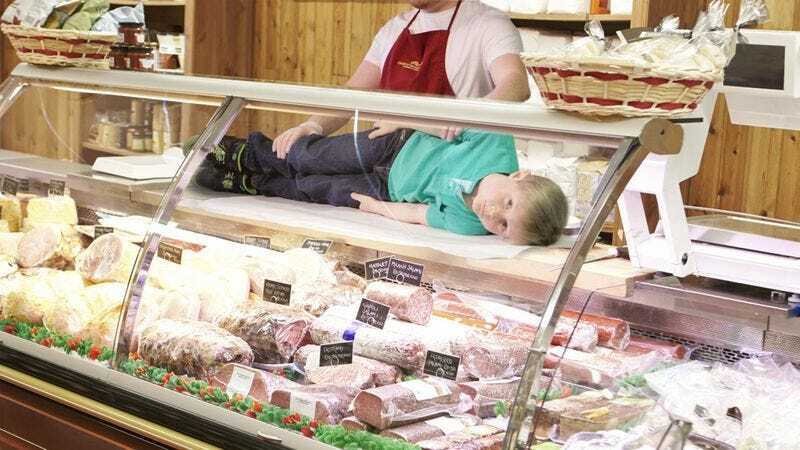 Once there, employees helped him up onto the metal food-preparation counter, placed him on top of a sheet of sandwich wrap, and then, instructing him to lay back and keep his arms at his side, slowly slid the 42-pound boy along the sandwich-making area just as if he were a giant turkey and provolone sub! And you can bet that there wasn’t a dry eye in the entire restaurant. When Alex had finished his journey across the counter, employees wrapped him up and helped him back into his wheelchair. And although he still had to go back to the hospital, we can only imagine that after such an amazing experience, he didn’t stop smiling for days. Dreams do come true! Share this article to show your support for Alex.